" Full-color cloth maps of Britannia, setting for Origin's Ultima roleplaying games.
" An antiqued bronze coin, a "zorkmid," in Infocom's Zork.
" A Japanese cloth headband from the Origin RPG Moebius; also, a booklet of the I Ching from the sequel, Windwalker.
" 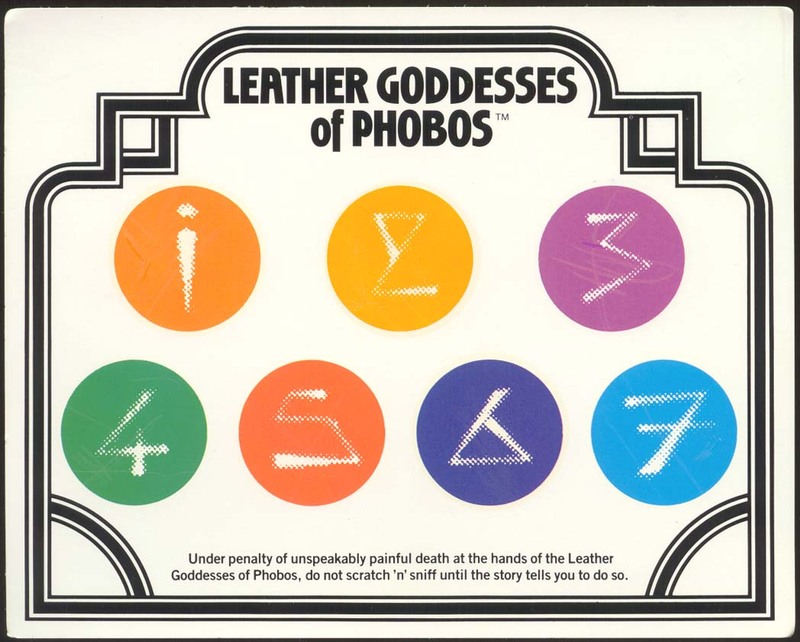 From Leather Goddesses of Phobos, a send-up of pulp space opera, a 3-D comic book (with glasses) and a scratch-n-sniff card.
" From the second Douglas Adams text adventure for Infocom, Bureaucracy, a three-sheet G-IC2-FIT form - a white original with yellow and salmon-colored copies - for a "Fillmore Better Beezer Card." The blanks on each sheet were the same, but the labels changed. The "Own condo/co-op" checkbox on the top sheet became, on the salmon sheet, "I wear ratty underwear." All these games date from the 1980s. That golden era of game packaging popularized the non-game items generically called "feelies." You kids today [raps cane on floor] can't imagine the creativity designers and publishers once expended not just on their games, but on their packages and contents. Feelies enhanced the mood and impact of their games, back when graphics were at best simple sprites. Often, feelies also provided a relatively graceful vehicle for authentication-word copy protection. If you're old enough to remember feelies, you're already murmuring "Infocom." Infocom text adventures were the state of the art, swag-wise: pens, postcards, calendars, photos, maps, comics, fiction - a feelie catalog showroom. Interactive fiction fans dutifully preserve photographic proof at sites such as the Infocom Gallery and the Infocom Documentation Project. According to Infocom "Marketeer" Mike Dornbrook, "The first exotic package was for Deadline (the third game, after Zork I and II). It was created because [designer] Marc Blank couldn't fit all the information he wanted to include into the 80K game size. Marc and the ad agency, Giardini/Russell (G/R), co-created the police dossier, which included photos, interrogation reports, lab reports and pills found near the body. The result was phenomenally successful, and Infocom decided to make all subsequent packages truly special. (A big benefit was the reduction in piracy, which was rampant at the time.)" Other publishers liked feelies, too. Origin prompts nostalgia (check the online Origin Museum) for those cloth Britannia maps and clever game-world-based documentation. Richard "Lord British" Garriott, mastermind of the Ultima games, and other Origin designers pushed hard for non-game trinkets in their games. Dallas Snell, Vice President of Product Development (PD) at Origin in the 1980s, recalls the inclusion of trinkets "was always driven by PD. Publishing sought to minimize COGS [cost of goods], whereas PD wanted lots of interesting support material, trinkets and doohickeys. The cloth map and the metal ankh in the Ultimas were a source of debate every single time. Publishing would always remind us the product could be played just as well with a paper map and a plastic ankh (or no ankh at all). Richard was consistently adamant about this, and always stood his ground - even if it couldn't be financially justified. "I am a fan of Ultima's cloth maps," Snell says. "Can't say it really facilitated game play versus a paper map, but it sure added an 'experiential' quality to the product that is seldom encountered. [And] I liked the actual film canister we shipped the deluxe version of Wing Commander III in. That was really cool!"